Are you one of the many people who suffers from either a dairy of gluten allergy, or even both? More and more people are finding out that they can no longer have some of their favorite foods due to a new food allergy that they grow into or finally get diagnosed with. I can thank my parents for my lactose intolerance, which I developed in my early twenties. As a result of the tummy troubles I have when drinking milk or eating foods like ice cream, I have had to omit them from my diet. It was so hard to say goodbye to ice cream as this, like many people, is one of my favorite go-to comfort foods. Whether I am having a blah day or simply want to satisfy my sweet tooth, a scoop (or two or three) from the ice cream carton would always do the trick. But, I hated always having to deal with the tummy troubles quickly thereafter. When I heard about DF Mavens and how they offer a line of gourmet dairy and gluten free frozen treats, I was so excited. While there are other dairy free frozen treats on the market, most lack the taste or flavor you come to expect from frozen ice cream. I was hoping that DF Mavens would fill my ice cream and frozen dessert void, while being gentle on my tummy. Made with only the finest cacao in Venezuela's tropical lowlands, DF Mavens Del Lago Chocolate dairy-free frozen dessert will satisfy any chocolate lover's sweet tooth, while not making you feel guilty if you find yourself finishing off a pint yourself in one sitting, as it is made with coconut milk. Who knew that you could enjoy a dairy-free frozen dessert and that it would taste this good?! Vegans, lactose intolerant and those with Gluten and soy allergies will rejoice when they try a spoonful of one of the many rich, decadent flavors offered by DF Mavens. I did end up sharing the remaining pints with my family and friend who had come for Thanksgiving dinner, and everyone had the same reaction as I did -- a huge smile on their faces after the first spoonful. They were in love with the this delicious and healthy frozen dessert, and couldn't wait to go in for another spoonful. With the holidays fast approaching, why not consider stocking up on a variety of DF Mavens frozen desserts to share with family and friends who come to visit? With so many people suffering from different food allergies, being on diets, having diabetes, etc., these gourmet frozen desserts will satisfy everyone's taste buds and leave them wanting more. You can order DF Mavens pints and frozen bars directly off of the DF Mavens website, and have them shipped right to your door. You can mix and match pint flavors or choose a particular 4-pack variety, all for only $31.96/4-pack (plus shipping and handling). Frozen bars are also only $31.96/4 boxes. To learn more about the different flavor collections, or to place your order so it arrives before the holidays, visit http://dfmavens.myshopify.com/. Then, sit back and wait for your cooler full of this decadent frozen dessert to arrive at your doorstep to enjoy! "DF MAVENS is currently available in stores throughout the east coast, and will be available nationwide shortly. If you are vegan or lactose-intolerant, try our regular line. If you have diabetes or issues with blood sugar, try our no sugar added line. Pick up a pint and see for yourself. Trust us. One bite of our dessert and you will have the best dairy-free day of your life." 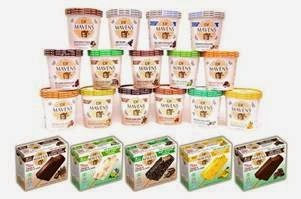 To learn more about DF Mavens and their line of gourmet dairy and gluten free frozen treats, as well as locations where you pick up these sweet treats if you live on the East Coast, visit www.dfmavens.com today. DF Mavens, a FAL Foods Brand, is based in New York, and their delicious frozen desserts are crafted by the 'Godfather of Ice Cream,' Malcolm Stogo. Stogo is known for inventing some of America's favorite frozen treats throughout his career (like cookies & cream flavor and the chocolate dipped waffle cone! ), and he has recently expanded his talents in developing, marketing and merchandising this line of new dairy-free products in the dessert space. Combining the finest and healthiest ingredients from around the world, all DF MAVENS products are dairy-free, gluten-free, do not contain preservatives or cholesterol and are available in delicious flavors such as Almond Mint Cookie, Del Lago Chocolate, Alphonso Mango and Key Lime Crème. DF MAVENS recently expanded their existing roster of decadent and creamy dairy-free desserts with the addition of their NEWEST product - Dairy-Free Frozen Bars. Visit www.dfmavens.com for more information.